Homeowners may allege several cases for putting off the home improvements on their to-do lists. The often high prices of residential exterior doors and the difficulty in installing them are two of the most accepted justification for why people delay in upgrading their entryways. But by working with DoorsVA.com, you can save big on your choice of the finest residential entry doors and even receive professional installation by skilled experts. Our collection includes Masonite, Therma-Tru and Andersen doors, along with many other top brands and styles. Take your time as you have a look at DoorsVA.com and consider calling for a free estimate to see how much you can save on the home improvement you've always wanted. Installing your own door can be a huge hassel, even when it's perfectly sized and you have the right tools. 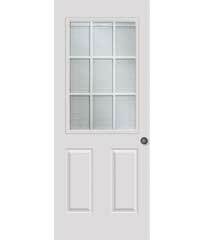 But if your new Andersen doors aren't sized just right for your doorway, the real headaches can begin. Give yourself a break and let the professionals take over by buying your next Andersen storm doors from DoorsVA.com. Our experts will come to your home, discuss with you on your entry door replacement options and give you a free estimate. All you have to do is select the style you want, and our professionals will quickly handle the rest for a highly competitive price. Sometimes replacing a door is an emergency rather than a matter of taste. If your front entryway is damaged or compromised, call DoorsVA.com about fast entry door replacement. We'll visit you as quickly as possible to determine the situation and provide a range of the optimal options. You can even choose from great styles of Masonite doors and designs from Simpson, Jeld-Wen and many others. For immediate attention and the solution to your emergency situation, call us at 703-430-7850. Your home is probably the biggest purchase you've ever made, so it's worthwhile to take care of that investment. DoorsVA.com is doing its part to increase property values throughout Northern Virginia with its selection of Masonite doors. These are some of the most beautiful entryways on the market, and we're offering them at incredible prices. If you reside in Fairfax or Loudoun County, call DoorsVA.com at the number mentioned in the above section for the ultimate in residential exterior doors and installation service. "Andersen" and the AW logo are registered trademarks of Andersen Corporation. EMCO Enterprises, Inc. is a wholly owned subsidiary of Andersen Corporation. Masonite is a registered trademark of Masonite International Corporation. All other marks where denoted are either registered trademarks or trademarks of Masonite Corporation © 2007 Masonite International Corporation. All rights reserved.